I love cinnamon buns, but homemade buns can be a bit time consuming to make from scratch when the craving hits. I’m not one to run out and buy a cinnamon bun in a situation like this. Instead, I made a batch of Quick and Easy Cinnamon Bun Bread, a yeast bread that tastes just like a cinnamon bun, complete with brown sugar and cinnamon filling, and comes together without kneading, shaping or waiting for the bread to rise! The original will always be a favorite of mine, but for a fall twist I turned it into a Pumpkin Cinnamon Bun Cake. 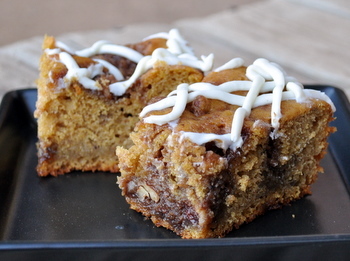 The Pumpkin Cinnamon Bun Cake is a sweet, yeast bread that is so tasty that it is more like a coffee cake than just a bread with a sweet topping. The dough is mixed up and there is no long rising time before putting the pan in the oven. This is achieved by using more yeast than you might ordinarily put into a bread of this size, and by putting the pan into a cold oven and letting it rise while the oven preheats with the bread inside! You can go from mixing dough to eating fresh cinnamon bun goodness – with a little fall flavor thrown in – in less than an hour. The dough has pumpkin puree and pumpkin pie spice (I use a homemade mix) mixed into it for flavor and is topped with a streusel/filling of brown sugar, cinnamon and chopped pecans. It bakes up to be sweet, moist and with a great balance of pumpkin and spice flavors. The topping is sweet, but the bread itself is only mildly sweet. The little bit of icing drizzled on top adds just the right amount of extra sweetness to bring everything together. It is best within a day or two of baking, but this is easy to serve up in generous slices and you won’t have a problem eating through a batch. You might even have to make two, if you happen to have a lot of cinnamon bun lovers to feed! Lightly grease an 8Ã—8-inch square baking pan. In a large bowl, combine flour, sugar, salt and pumpkin pie spice. Dissolve the yeast in a small bowl filled with the warmed milk and let stand for 2-3 minutes. Stir milk mixture, pumpkin puree, vegetable oil, vanilla extract and egg into the flour mixture. Mix well, until very smooth. While the dough rests, make the topping. Mix together butter, brown sugar, cinnamon and nutmeg in a small bowl using a fork until all the butter has been incorporated into the sugar and mixture is crumbly. Stir in pecans. Sprinkle evenly on top of rested dough and press the mixture down into the dough with your fingertips (or swirl in with a spatula). Bake for about 30 minutes, until bread is golden brown at the edges and the center of the bread springs back when lightly pressed. Some of the sugar mixture on top may still be bubbling. Cool in the pan for at least 30 minutes, then prepare the icing. Whisk the powdered sugar and milk together to form a smooth, pourable icing and drizzle it onto the bread using a spoon. Serve warm or at room temperature. Leftovers can be reheated in the microwave. Wow! These look delicious and would be a great dessert for Thanksgiving. i like that this cake has yeast – it looks delicious! I love cinnamon buns! I think I love it even more in your cake form. Yum! this looks so delicious, definitely saving the recipe! do you bake it 30 minutes from when you put it in the cold oven, or 30 minutes after it reaches 350 degrees? thanks! Wow – this looks delicious AND easy! I love how quick and easy this is! YUM! if i wanted to double the recipe, any idea about how long to bake it for a 9×13 pan? guess i could just use two smaller pans if doubling wouldn’t work well. Another use for pumpkins is always welcome here! I’m cooking sooo many things with pumpkin right now and it’s my fav. flavor!! I love anything with a streusel top, and this is perfect for this time of year! I bet this is seriously good. I’ve had the plain version and it was outstanding! I made this for breakfast, and it was devoured in minutes. Thanks for the fantastic recipe. Okay, I’m now getting back to you… In fact, this recipe was FANTASTIC!!!!! I ate most of it, as it reminded me of a cinnabon and we don’t have that here in France- In fact, cinnamon is not widely used here in desserts so it’s always nice for me to use one of my FAV. spices!!! I also LLLLLLLOOOOOVVVVEEE anything with pumpkin!! Great recipe and it turned out PERFECT!!!!! A great idea when you don’t have space to roll out dough for regular cinnamon rolls. I’m getting ready to make this for my librarians. Hope they like it as much as I like the idea of it. Thanks for the reminder on your site header. I love that new header!